With my gallery show opening in less than two weeks, I’ve retreated from my home and business life in order to recharge my batteries and get ready for festivals and shows running through the next month-and-a-half. On November 4, I’ll be showing at the Genny Wood Art Show and Sale in Bullard, Texas. November 11 will feature the opening of my “American Railroad Odyssey” show at The Gallery at Redlands in Palestine, Texas. That show will run until December 16. I will also spend three days at the Randy Brodnax and Friends Christmas Show in Dallas at the Sons of Hermann Hall December 1-3. All of this information may be found on my website www.recollections54.com. The Gallery at Redlands in Palestine, Texas, nestled on the ground floor of The Redlands Historic Inn at 400 N. Queen Street, opened in March 2017 with a one-man-show of David Tripp’s watercolors. Once the show ended, David was invited to remain where he now enjoys creating and selling his art. Retiring after three decades in a classroom, David currently enjoys his new role as Adjunct Professor of Religion and Philosophy at Texas Wesleyan University, and more time pursuing his passion in the art studio. His watercolors feature small-town American sights fading from our landscape, but not our memories. In 2015 he discovered a new genre, the Texas Laguna Madre, and spent two weeks living alone on an island there, painting as Artist-in-Residence for Texas A&M University Corpus Christi. David, a native Missourian, grew up in St. Louis and studied art in rural northeast Missouri while earning his Bachelor’s Degree from Truman State University. Residing in Texas since 1977, he draws his watercolor subjects from a host of “recollections” involving cities, small towns and rural stretches throughout the Midwest and Southwest, particularly old Route 66. David finds inspiration for his art from the life and works of Andrew Wyeth and Edward Hopper. Having earned his Masters and Ph.D., he seeks ways to blend his academic studies with his art creations, and particularly loves the writings of artists Robert Motherwell and Robert Henri, along with literary giants including Ralph Waldo Emerson, Henry David Thoreau and Marcel Proust. The poetry of William Carlos Williams, Robert Frost and Walt Whitman also drive his imagination. These artistic and literary geniuses he regards as kindred spirits. They were frequently surprised by the revelatory powers of objects connecting them with primal memories from the past. These objects, viewed on location, as well as in works of art, have a way of “drawing the viewer in.” And we are usually grateful for that primal experience. Since March of 2017, David has focused most of his artistic energies in pursuit of subjects from the Texas State Railroad in addition to the broader legacy of the American railroad. 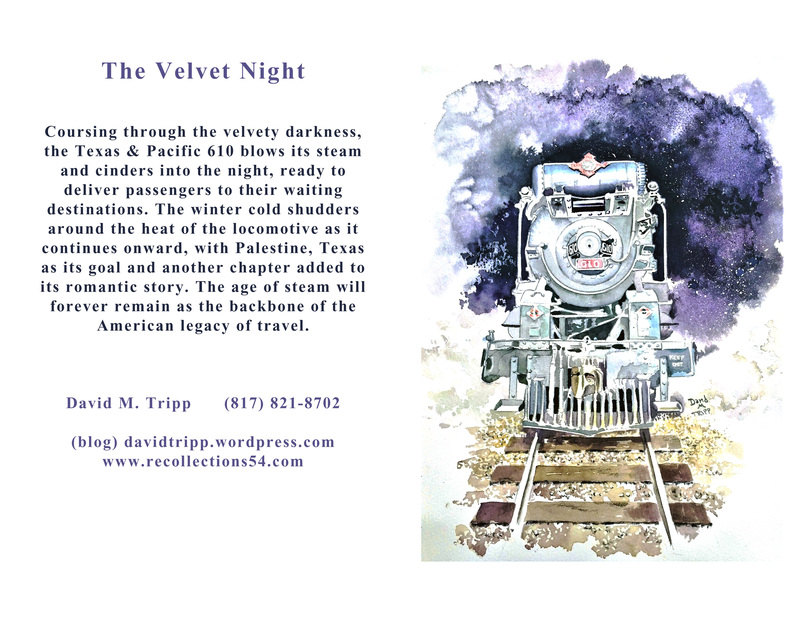 Dave Shultz, professional photographer and my new friend residing for now in Palestine, has been formatting my latest train watercolors into 5×7″ greeting cards I’m selling for $5 each, 5 for $20. Here are the latest ones I’m offering. This weekend, I’ve chosen to escape the whirlwind. I won’t bore you readers with all the details of the week, preparing for my Genny Wood Show in Bullard, Texas next weekend and then the opening of my “American Railroad Odyssey” show the following weekend in The Gallery at Redlands. I have chosen to take this weekend away from the Gallery and Palestine, needing some down time. I have a new train watercolor in progress and may work on it this weekend, but I haven’t yet decided. Right now, I’m cloistered in a Barnes & Noble Cafe, loving this new Leonardo da Vinci biography by Walter Isaacson and catching up on some journal time. If I go silent for the rest of the weekend, it only means I am enjoying the quiet, and promise to return when next week. My shipment of coffee mugs arrived and I’m happy that ten of them sold on the first day. There are still plenty more in stock, and if they all sell, then I’ll just order more. I have priced these at $15 plus shipping. When a new planet swims into his ken . . .
For a month, I’ve waited for Walter Isaacson’s biography on Leonardo da Vinci to come out. I have been enriched by two of his earlier works on Benjamin Franklin and Albert Einstein. Finally, yesterday, I purchased this latest work and pored over its pages until I could stay awake no longer in the night. Retiring to bed early, I set an alarm and rose at 5 this morning so I could return to it. Throughout my life, I have known the exhilaration of Keats when he happened upon Chapman’s translation of Homer. Indeed, I feel the thrill of the astronomer discovering a new planet. A new portal opens before me, welcoming me to a broader, more enchanting world. Isaacson has chosen to focus on Leonardo’s notebooks, and I’m finding that to be a refreshing point of departure. I have had the pleasure of reading a number of Leonardo biographies, and I’m fascinated with Isaacson’s emphasis on the curiosity of this Renaissance Man. I myself have journaled since 1985, and now have over 130 volumes on my shelf. Some of the pages are worth re-reading, many are not. Nevertheless, my mind has stayed fresh because of this habit of scribbling constantly the ideas fleeting across the screen of my consciousness. I believe that journaling has contributed to the energy necessary for writing and making art, and above all, believing. Journals, to me, are nets for organizing wonder. I could never exhaust the list of creative spirits who have inspired me throughout my years, either through their scholarship, their creative writing or their visual art. The ones I find myself continually rethinking and re-examining include Paul Tillich, Ralph Waldo Emerson, Henry David Thoreau, William Carlos Williams, Robert Henri, Edward Hopper, Andrew Wyeth, Robert Motherwell, Friedrich Nietzsche, Martin Heidegger . . . and the list continues to grow. The contemplative life has saved me repeatedly throughout the years. If finances go bad, relationships sour, employment stales, artistic momentum fades . . . I can always depend on this constellation of geniuses to inject new blood into my system. I am aware of the conventional wisdom urging us to maintain a broad network of friendships, and I believe my friendship network is rich. At the same time, I acknowledge that I am an introvert and many times find the need to draw my inspiration from the “dead heroes” who to me are not dead–they still reach out to me through the creative tracks they left behind. The hour is drawing late, but I wanted to post this photo of a new train composition I began working on today. Time is running out for my November 11 train show, so this could possibly be the last painting completed before the show opens. I look forward to detailing the locomotive tomorrow. This subject is the old #300 of the Texas State Railroad. It is a Baldwin 2-8-2 Mikado steam locomotive that is one hundred years old this year. The number has been changed to 30 now, and the paint scheme is also different. From pictures of the past, I’ve learned that this train was trimmed in red and yellow. I look forward to seeing how this different color scheme will play out beneath the night sky. 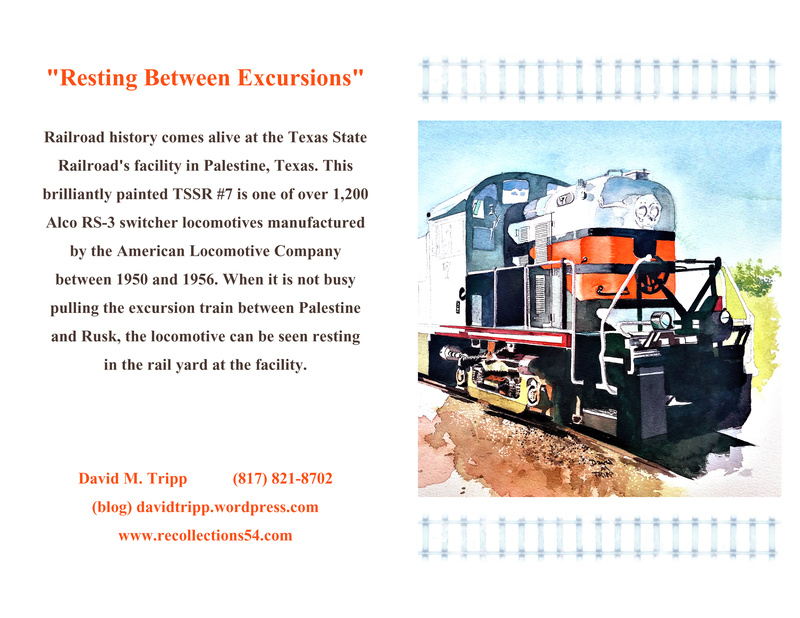 Heads turn and hearts stir every time the whistle blasts from this Palestine-to-Rusk excursion train. The Texas State Railroad #30 is a Baldwin 2-8-2 that celebrated its birthday in October 2017, looking just as fresh and new as it did the first time it pulled onto the tracks. The wheel arrangement is called Mikado, named after a group of Japanese locomotives designed by Baldwin for the Nippon Railway in 1897. The four-hour round trip odyssey through the east Texas piney woods makes this train a popular favorite among rail fans and excited children. The morning started out with a bang. Dave Shultz, a remarkable photographer whom I recently met, is residing at the Historic Redlands Inn and spent time with me in the gallery over the weekend. I’ve known of his work for months, and admired what he’s done for the Redlands website as well as his photographs of sites he visits as he travels the world. I awoke at 6:00 and found the greeting card I posted on this blog last night, formatted and ready for the printer. Before 8:00, he also formatted the card that I’m posting above and prepared another of my train watercolors for limited edition prints. And then . . . I suddenly received orders for three more coffee mugs (I’m selling them for $15). When I dropped off my cleaning at Boss Cleaners, the proprietor offered to sell my greeting cards from her counter as well. I’ve been selling these cards, printed on Hallmark Card stock with envelopes in a plastic sleeve, for $5 each or 5 for $20. I’m out of breath at all these new developments, and it isn’t even 9 a.m. yet! I’ll be selling my work next at the Genny Wood Show in Bullard, Texas on Saturday November 4. Thank you, Dave, for your friendship and inspiration. 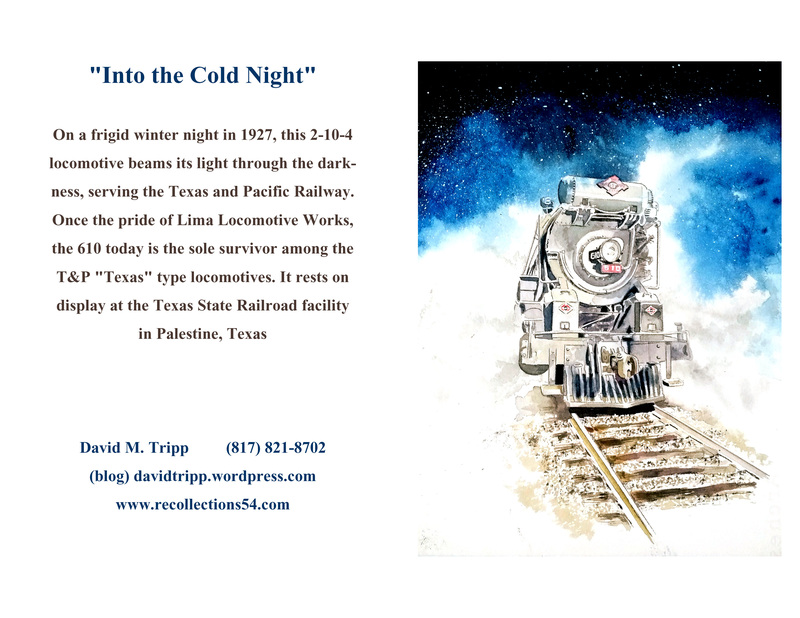 Visions of the historic Texas & Pacific #610 cutting through the snow beneath a star-littered night sky should fill every soul with the warm sentiments of Christmas. This majestic 2-10-4 steam locomotive, created in 1927 by Lima Locomotive Works, pulled trains between Shreveport, Louisiana and El Paso, Texas until it was retired in 1950. In February and March 1976, it pulled the bicentennial “Freedom Train” across Texas. This magnificent locomotive today rests in a dark and quiet train shed in Palestine, Texas, but stories of its journeys live on in the American imagination. As time draws nearer my November show of train watercolors, I am now making greeting cards of every new train painted this year. The above is my first draft of the most recent painting. I suppose I need to find another gear, because there are eleven other paintings needing texts for cards. We are planning to show the original paintings along with limited edition signed & numbered prints, postcards and greeting cards of the entire collection. To date, there are about twenty framed paintings selected for the show. I have started a new one this evening of the historic #300 that has been used in the excursion train that runs between Palestine and Rusk. The locomotive, one hundred years old this year, has been re-numbered as #30 and featured in one of my recent works. In prior years, as the #300, the engine featured bright red and yellow colors. I plan to contrast these beneath another starry night sky. “The American Railroad Odyssey” is the title of my next show at The Gallery at Redlands, opening November 11 and extending till December 16. I was delighted when I visited Palestine this past weekend to discover that their local frame shop had completed work on eleven of my twelve watercolors to hang in the show. I believe I will have at least twenty framed originals to hang when the show opens, accompanied by signed and numbered limited edition prints and greeting cards. I finally reached home tonight after a grinding weekend at the Hot Pepper Festival, but wanted to toss out this blog before saying Good Night to all of you.